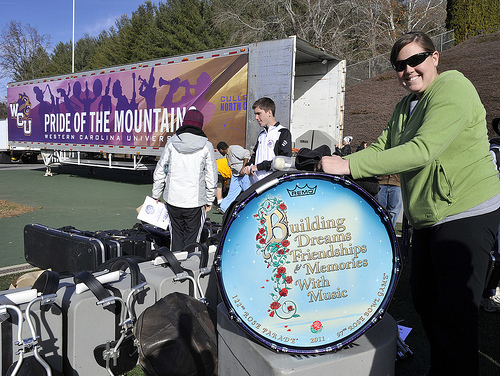 Taylor Jandes, a junior from Clemmons, will play bass drum in the 2011 Rose Parade. Jandes is a music education major at Western Carolina University and alumna of Mount Tabor High School. The band will honor the parade’s theme not only on the drums but also with the musical selection for the Rose Parade. The image on the bass drum depicts the theme of the 2011 Rose Parade, “Building Dreams, Friendships and Memories,” and the band will strive to bring the theme to life by performing “You” by California ska band Suburban Legends. Matt Henley, assistant director of the WCU marching band, said the music selection came about as he was thinking about the parade’s theme and remembered a story about Suburban Legends. After a member of the group, trombone player Dallas Cook, died in a traffic accident, Suburban Legends held a memorial concert and directed proceeds to Cook’s high school marching band in Huntington Beach, Calif. Cook had credited his experience in high school band for much of his passion for music. Moved, Henley contacted Suburban Legends about the possibility of playing the group’s song in the parade and building a friendship.